Eggs can be part of a healthy diet even though they're high in saturated fat and cholesterol. In fact, according to a summary of literature published in "The American Journal of Clinical Nutrition" in 2013, eating eggs isn't associated with a greater risk of cardiovascular disease. But the cumulative research suggests eating eggs and increased incidence of type 2 diabetes may have a correlation. Choose healthy methods for preparing eggs, without adding extra fat and calories. 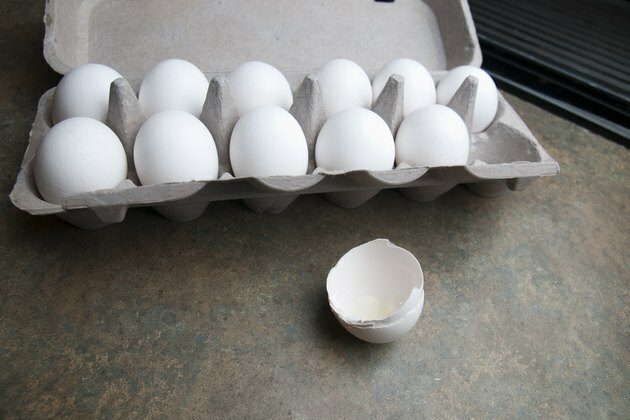 Boiling eggs adds no extra fat. 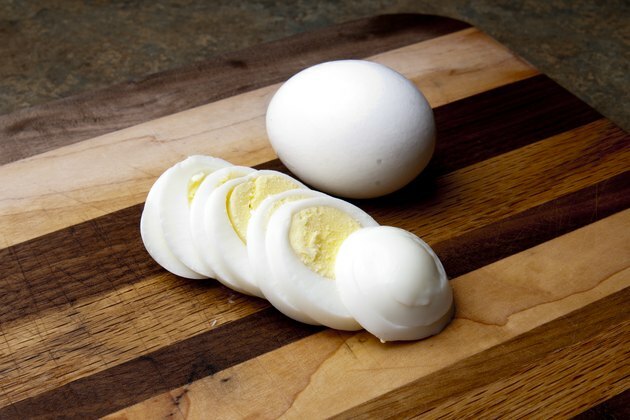 One large, hard-boiled egg has 5.3 grams of fat, 6 grams of protein,186 milligrams of cholesterol and 78 calories. Serve the boiled eggs soft or hard with 100-percent whole-grain toast or use them as ingredients in recipes for dishes such as deviled eggs and egg salad. Look for recipes that go easy on fat and include other nutritious ingredients. Traditional scrambled egg recipes often call for milk, but if you use water instead, your scrambled egg will have the same fat, cholesterol and calorie counts as hard-boiled eggs. Alternatively, separate the yolk and use only the egg whites. One scrambled egg white has 17 calories, 3.6 grams of protein and almost no fat. Boost the nutritional value of scrambled eggs by adding chopped peppers, onions, mushrooms and spinach. 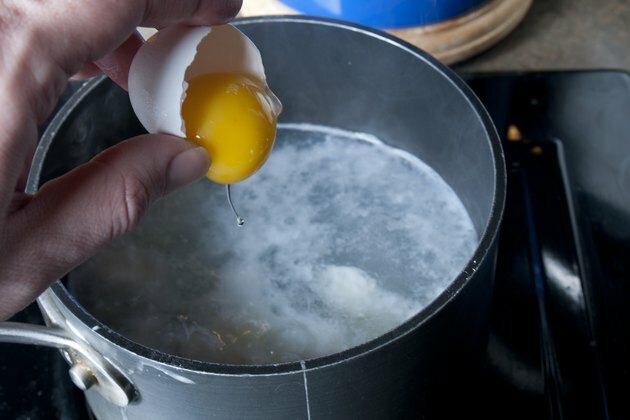 Poach eggs by simmering them in water after removing them from the shell. No extra fat is necessary, so poached eggs have the same nutritional value as hard-boiled eggs. Serve the eggs over 100-percent whole-grain toast or on top of cooked green vegetables, such as asparagus, to add more vitamins, minerals and fiber to your egg dish. 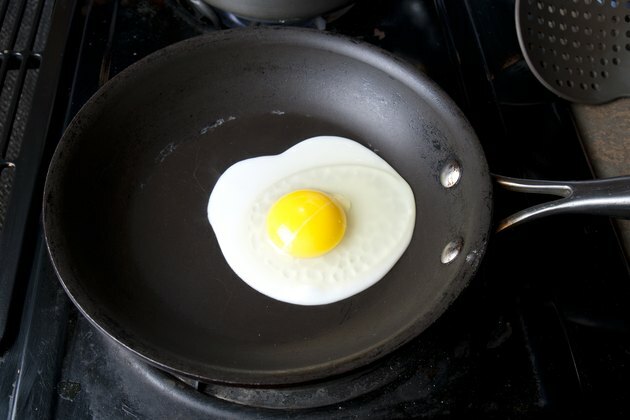 A large egg fried in butter or margarine has more calories and fat, but you can avoid the extra fat by using an oil spray or a nonstick pan. Fry the eggs and cook the yolk thoroughly to avoid the risk of salmonella. Serve fried eggs with 100-percent whole-grain toast or with cooked vegetables and potatoes. Avoid creamy sauces and cheese topping for your eggs.